Whatever happened to the resurrection? Whatever happened to being raised to new life in Christ? Whatever happened to being new creations? One reason we don’t see more new creation living is because few of us have died to the old creation. Before we can rise again to new life, we must die to the old life. 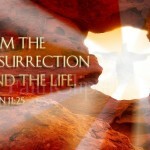 Death precedes resurrection.